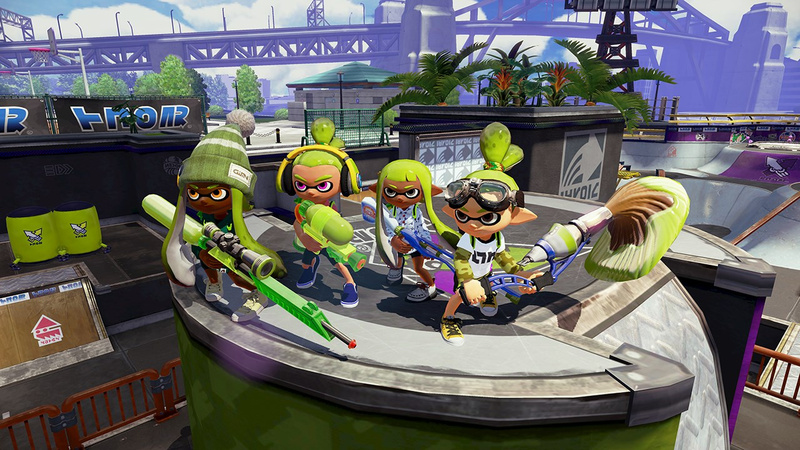 Today marks the launch of Splatoon, Nintendo's infectious take on the traditional team-based online shooter. While this ink-splattered offering is far more friendly and accessible than your typical web-based blaster, there are still a few key points you might want to keep in mind before dashing - or should that be swimming? - headlong into enemy territory. Below you'll find some quick-and-easy tips on how to improve your game and become a Splatoon crack-shot. Let us know if any of these hints helped you personally, and be sure to leave your own pearls of wisdom for other players by posting a comment at the end. 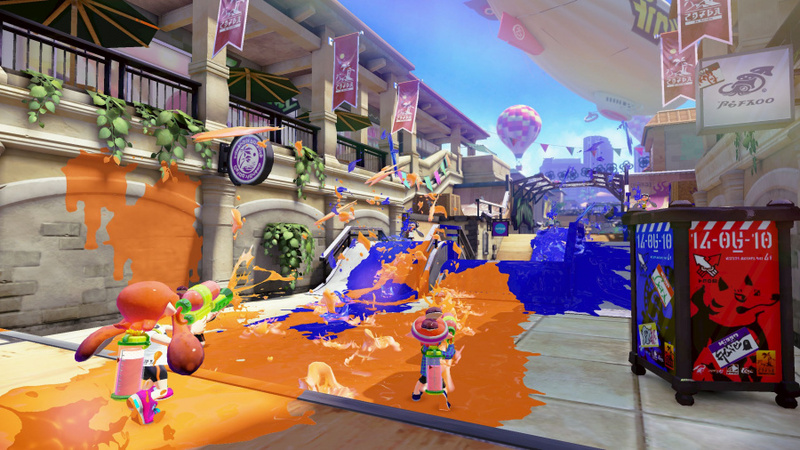 Splatoon's control system has been the subject of much debate over the past few weeks. The default setup uses a twin-stick arrangement, but is augmented by motion controls which can be used to fine-tune your aim. Some players have found this configuration to be a little difficult to master, largely because you're looking at the TV when moving the GamePad around, rather than looking at the controller's screen - which would arguably make a lot more sense. Thankfully, Nintendo has seen fit to include an option which switches off the motion controls and turns the game into a proper twin-stick affair. If you really, really struggle with the motion controls then we'd recommend ditching them entirely, but it has to be said that the game seems to flow much more effectively with them enabled. The single-player campaign provides the ideal place to become accommodated to the controls, so make sure you give them a fair crack of the whip before toggling them off - the additional accuracy is noticeable, and certainly comes in handy when you're using the Charger weapon type. 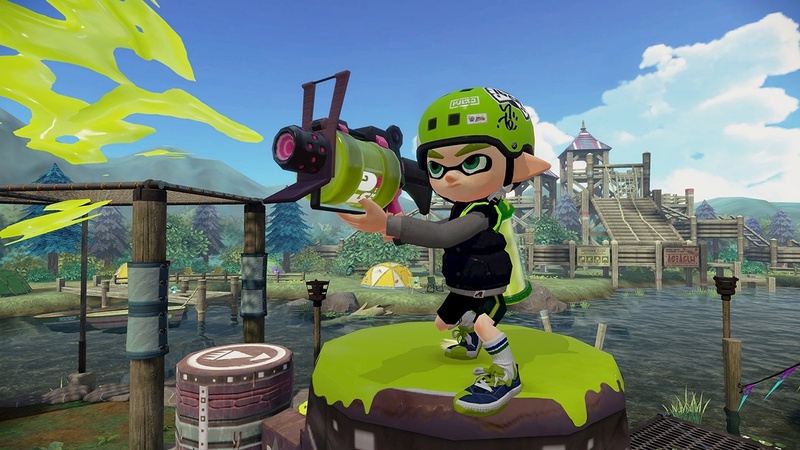 There are three main weapon types in Splatoon. The Shooter type is your typical gun, and discharges a series of ink-bullets in quick succession which are great for taking down enemies and covering the landscape. It's the best weapon for beginners as it allows you to learn the ropes before moving onto the more specialised armaments. 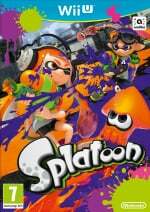 It should be noted that in terms of diversity, the Shooter category wins out - although the Splattershot and Blaster are both classed as Shooter types, they couldn't really be more different in terms of how they are used; the former offers rapid fire while the latter is more akin to a grenade launcher, depositing massive globules of ink that inflict impressive splash damage, but with a painfully slow rate of fire being the trade-off. The Charger is like a sniper rifle, and can take out distant targets in a single shot - the drawback being that you have to charge up your shot before doing so. 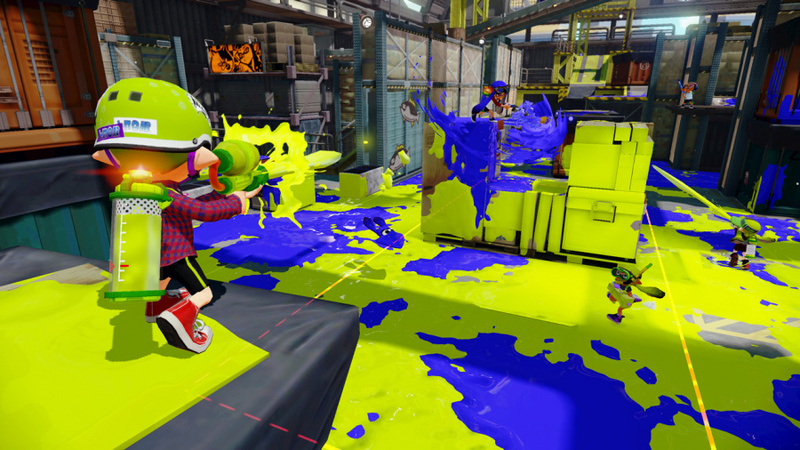 Another problem is that your shots don't cover much ground in ink, which means you'll need to drop into a supportive role, helping to cover your teammates from higher ground while they do their utmost to paint the level. The Roller weapon is, as the name suggests, like a giant paint roller and is ideal for covering large portions of the map. 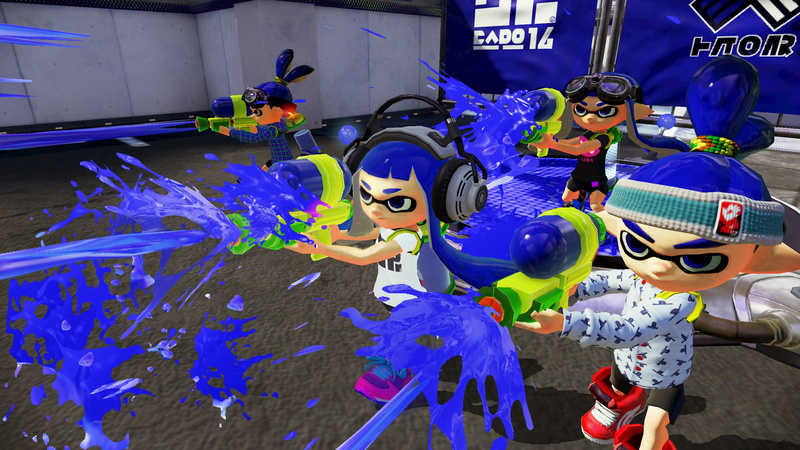 You have to be aware that you're quite vulnerable when using the Roller - although the weapon boasts a powerful ink-flicking move for taking out nearby foes, its range is painfully limited. You'll need to work as part of team to ensure you don't get gunned down by the enemy. Each weapon class is made up of different variants, each with their own strengths and weaknesses. In this respect, no weapon is necessarily better or worse than any other; for example, in the Shooter class you'll have guns which fire more rapidly but lack power and range - and vice versa. Picking the right one is often down to personal preference - and the sub-weapon that comes with it. Each weapon has secondary attack - such as a grenade or sticky-bomb - and these can often make some of the seemingly weaker guns much more useful. Just keep in mind that sub-weapons consume a lot of ink, so you'll need to use them at the right time. Turning into your squid form not only allows you to top-up your ink reserves - provided you're in your own team's ink, of course - but it also means you can move much quicker. If you're making a dash through territory your team has already claimed, don't do it on foot - it takes longer and you're hopelessly exposed to enemy fire. Moving as a squid means you're much harder to spot, and if you remain stationary then you can effectively hide from the opposing team - something which can be used to ambush incoming inklings. If you want to move quickly, then your choice of weapon has a big impact - the Splat Charger's superb range means you can create an inky pathway right at the start of each round, allowing you to reach vital points of the map faster than usual. You can also use the Seeker sub-weapon - which comes with the Aerospray MG - to get in the enemy's face quickly (watch the start of this video for an example). Also, if you want to get into the thick of things quickly, but sure to use the Super-Jump move. This allows you to leap to the current location of one of your teammates. When time is short and you need to reinforce your front line, this is the only way to travel - but keep in mind it can also be used to extract yourself from sticky situations, too. You can jump to the position of any teammate, or choose to leap back to your spawn point for the ultimate safety move - just watch the Super-Jump's quite lengthy charge time, as you're vulnerable during it. You can't buy any gear until you reach level 4 - something which might seem a tad unfair but actually means you have to focus on learning the core mechanics of the game before you start customizing your inkling. Once you're at level 4 you can buy new weapons and clothing in one of the game's many stores. Weapons we've sort of covered already - suffice to say, the higher your level, the more choice you have - but clothing is worth a closer look. Clothing is divided into three categories - headgear, bodywear and footwear. Each item comes with a buff of some kind - for example, some speed up your respawn time or enhance your weapon's power, while others increase your ink reload time or allow you to Super-Jump faster than usual. When selecting your clothing, it's a good idea to look at the various buffs and see if you can put together a winning combination which augments several key areas. As is the case with weapons, you gain access to better gear the higher your rank goes, and the really good items offer multiple slots for buffs - which essentially means a better chance of success in each battle. Bonus buffs are applied randomly when the gear's level is increased - to do this, you need to fight online while wearing the item for a prolonged period of time. What this means is that a newly-unlocked and expensive item of clothing might offer the potential for more buff slots, but it will be - for a period of time, at least - less useful than the upgraded gear you already have. Swapping out your gear isn't always a case of upgrading to a "better" item, so pick and choose wisely. All of Splatoon's online Turf War maps have points where the action is hottest, and controlling these points is often the difference between dominating your opponent and failing miserably. On the really narrow maps it's a good idea to dash to these points as quickly as possible when the match begins. Losing control of these points often means it's tricky to break out of your side of the map, and that severely limits the amount of territory you can cover with your ink. Some levels have choke-points that contain high towers that are ideal for sniping from or generally controlling that area of the map, but these are exposed and often become the focal-point for incoming attacks. Use these towers wisely and you can turn the tide of battle, but don't outstay your welcome. Locking down choke-points is one of the most effective tactics in Splatoon, but beware that there are always alternate passageways which the enemy can utilize to get around the blockade. Learn the maps and memorise every passageway, and you won't get surprised by an outflanking move. While it's tempting to try and take out as many of your opponents as possible, it's vital to remember that when the ink stops flying, the winner is decided by how much ground is covered. Try to make this your focus, even when you're stalking enemy inklings - if you're using a Shooter weapon then keep your finger on the trigger to cover ground even when you're moving. Try to cover enemy ink rather than bare ground whenever possible - not only does this add to your team's territory percentage, it detracts from that of the opposing team - so it's a double-win situation. If you're using a Charger, take out enemy threats so that your teammates can cover as much territory as possible unmolested. Also, keep in mind that it's only horizontal surfaces which need to be inked - any surface that can't be seen from the air doesn't count towards your total at the end of the round. Alex Olney contribued to this guide. Want to know more about Splatoon? Check out our handy summary of the game, as well as our review. It is still too early in the game, but so far I am having the best results with the Gal shooters. Not very good at covering terrain with your Ink, but able to stand up against anything the opposition throws at you. Also, ive seen a lot of players already, who try to play this game like any other shooter = Go for the kills. Ive been MVP in pretty much every match ive played by simply running around and painting the floor. Its as simple as that. Dont concentrate on the enemy too much. Make a puddle of paint in a far off corner, hide in it and wait till the opposition is finished with painting, pop out, recolor it. I'll play later. But on the test fire, that shield skill is super effective against rollers. Do the vertical surfaces count towards your personal score? I swear I spent 3 demos painting everything I could. @rjejr Thats what i want to know too. My best guess is, that the total percentage is calculated from the birds eye map coverage only. So just flat surfaces. Does anyone know if Turf War is the only online game mode? I was only able to play the demo for about five minutes, so I haven't actually gotten to play around with it much. Why did I have to start my summer job today of all days? 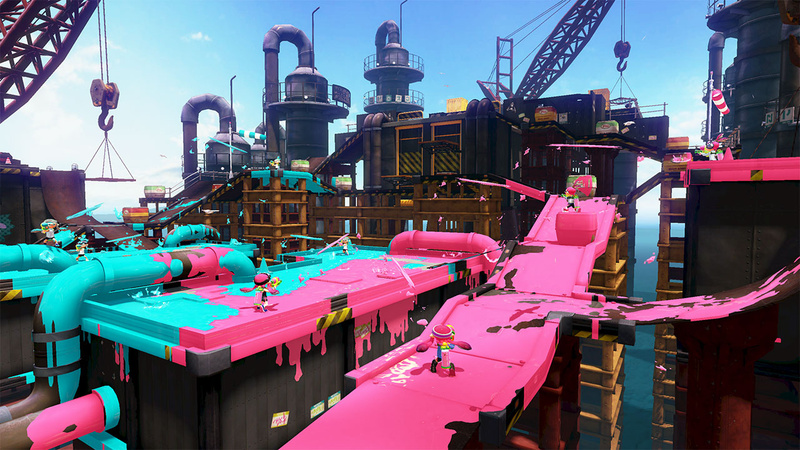 I'll definitely look forward to Splatoon when I get back. In the game, everyone on my tean always runs about trying to get kills, I'm the only one who gets work done and almost has to carry the entire team. Here's some free advice: at the beginning of the match, ink your base. It's free ground, it doesn't take much time, and the enemy can't get to it. It might save the match for you! Vertical surfaces were only half the points as floors if I remember correctly. Didn't know about the horizontal surfaces! Cheers! @CamWFC91: I didn't either, thanks for the tip! I expect Squidward to make a cameo at least. Be, in my case, 30 years younger. Nothing can beat having the reaction time of a ten year old. The last line is a good bit of info that I didn't know prior to this article, "any surface that can't be seen from the air doesn't count towards your total at the end of the round." I am having a blast online! I hated the Splat Charger in the Global Test-fire, but I am loving it in the full game! You can cover so much ground if you get on top of a highpoint in the map. Plus, it just feels so awesome to ink-out the competition with it. It is an inkstanding weapon! as for the coverage question, something the keep in mind: even ramps have a horizontal component to them when viewed from the top down... get at least everything not vertical and you'll be effective. and don't forget about tops of crates and boxes!!! valuable percentage point and often unnoticed. What guns u guys use? Or what type u use the most? I use splattershot pro, because it has great range and damage and it looks cool. Learn your arsenal then realize splattershot jr is the only weapon cause bubbler trumps all other specials. I am only a level 6, so I still use the originial Splat Charger. It is just too good! Actually the Squiffer, I think, has the bubbler, too. Ah, good tip about inking your opponent's ink before worrying about any nearby blank ground. The illusive obvious, as it were. Edit: It's also cool to see Nintendo giving Splatoon their full marketing support—in cool ways too; such as in that video you linked—because it really looks like it deserves it. Pretty soon I'll be getting off work, picking up my copy, and heading home to play Splatoon! @Einherjar It's only horizontal surfaces and slopes. Of course some surfaces have the ink simply run off, so they don't count. @evanescent_hero yes, and whilst doing that you can look at your gamepad without much worry of being attacked, so can plot your squid-swim journey better. However, I don't know how to jump to the place your furthest away team mate is, so knowing that is next in the list along with the shield trick. @ElkinFencer10 If you reach lvl 10. You'll get another mode. And there will be more modes via free upcoming DLC. Awesome! Thank you. I haven't been able to keep up with the details of the game as closely as I'd have liked to. I've been using the splattershot to run lines of ink around the map I can then use to either escape, refuel or get close to enemies for a kill. All while taking chunks out of enemy territory. I must admit I mostly go for kills, but doing a line across the open areas near the enemy spawn just means they get disrupted swimming to wherever the battle is taking place or distracted filling it back to their colour. Also I've found penning the enemy into the area around their spawn, even for 20 seconds, others in the team will go fill in the areas behind. Another tip is to make sure you go down the side corridors some maps have at least once with your colour. They may get filled back by the enemy but often they're underused and stuff I've inked sin the 1st minute is still there when counting scores at the end. I had awesome game where we did win with 0.1% because i launched inkstire last second. Splatoon lives up to the hype! The addiction is real! PREPARE TO DYE! Played about an hour and a half today. The servers are nearly flawless, and I experienced no lag at all. I did get kicked from a lobby once, but it takes literally about ten seconds from the time you join a lobby to the start of a match, so I was back on in no time. Compared to the MG, I think the extra damage of the default splattershot jr. is worth it versus the slight movement and fire rate you're giving up. Plus you don't have to aim your special. @Captain_Toad Not straight away you don`t. Nintendo are waiting until there are enough people at level 10 or higher, before unlocking Ranked mode. It was suggested it might happen over the weekend, or perhaps Monday morning. They say using rollers makes one more vulnerable, but I have yet to kill any opponent who was using a roller. Cover every inch of your starting area, it could win the match for you. @akaDv8R Oh, Just turf war 4 now? K, thanks. One check of a game! Thank you Nintendo. Game is fantastic. Everything I hoped it would be! Excellent guide too, I had been curious about vertical surfaces. I love the Splattershot Jr the most but whenever I don't take the offensive (in terms of turf coverage) and equip a more supporting weapon, my team tends to lose! Like I have so much fun picking off opponents with the charger weapons but whenever I have one equipped, my team ends up not being very well rounded or just misunderstanding the concept of team. Most of the time, I'm still MVP of my losing team with a Splatcharger! Lol. I'm hoping as time goes on that more players create a role for themselves and understand the roles/limitations of their teammates based on weapon choice. They preview everyone's weapons for a reason! Another good tip is when your teammate is squid jumping to you, you should do your best to make a safe entry for them. It ain't cool jumping into the heat of battle just to be killed by a waiting enemy or even to have to land in a pool of enemy gunk. But of course the teammate should do their part and consider the safest person to jump to as well. All in all, I'm having loads of fun. Its very hard putting this game down--even when my gamepad needs charging. I'm personally very fond of the gyro controls. I had turned them off in the Testfire and felt extremely hindered. I use them in MK8 as well so perhaps I am just used to them. Know when to use the super jump. More than once I was able to jump in save a team mate, and take a ton of territory rather than swimming through stuff we already controlled. Take high ground surface. I was able to do the best taking the tops of crates and high walk ways, that no one else even went for. Pay attention to the map, to see the biggest areas you can attack, sometimes it's best to hit the areas no one else is competing for, while other times it's best to wipe out a huge swath of enemy ink. I don't really get why people are saying: "kills are not important in splatoon". They freaking are important. Death Squids can't paint - every lost second is crucial. @OddworldCrash and squids who only try to get kills (i.e. a ton of people online) are wasting their time. Every second they aren't shooting enemy territory, and are only looking for the enemy, is time wasted. They are important, but it really isn't a good idea to solely focus on the kills unless you're in an organized team where that's your job. @rjejr No vertical surfaces don't count. You only paint walls for travelling across or hiding in. 1. At the start of the match, aim high and shot so you can swim and refill ink until you need to resurface and shoot more to continue creating a path to move. I do this to get to the central "choke" points asap and claim the high points. These sections are the key to winning! 2. If you're being flanked, drop into a small inconspicuous pool of ink and stay still! Staying still as a squid renders you invisible to the enemy! Also take advantage of walls for hiding. 3. Use your sub weapons! Grenades are especially helpful to use before going over blind areas, like in the Mall map. 4. Take advantage of every way to access choke areas beyond the normal route. In the Mall map, you can go on the sides and shoot from above. Really helps to get your team back in if its been taken over. 5. Don't waste too much time covering your base at the start of the match. It's more important to claim choke points. If you respawn with those areas claimed, then it;s wise to go ahead and cover your base. 6. Don't invest too much time in front of the enemy base. While it might distract them, they are bound to reclaim their home turf. 7. Split up! If someone is following you, get away from them ASAP.